Lily Sanderson has a secret, and it’s not that she has a huge crush on gorgeous swimming god Brody Bennett. Unrequited love is hard enough when you’re a normal teenage girl, but when you’re half human, half mermaid like Lily, there’s no such thing as a simple crush. When Lily found out three years ago that her mother was actually a human, she finally realized why she didn’t feel quite at home in the ocean, and she’s been living on land and going to Seaview high school ever since, hoping to find where she truly belongs. Sure, land has its problems – like her obnoxious, biker boy neighbor Quince Fletcher – but it has that one major perk – Brody. The problem is, mermaids aren’t really the casual dating type – when they “bond,” it’s for life. When Lily’s attempt to win Brody’s love leads to a tsunami-sized case of mistaken identity, she is in for a tidal wave of relationship drama, and she finds out, quick as a tailfin flick, that happily-ever-after never sails quite as smoothly as you planned. This month has been pretty hectic on the blog. Lots of author and artist interviews, guest posts, feature posts and all sorts of stuff all to do with Steampunk. As much as I adore the odd-ball genre, it can get a little long winded, an like anyone, I get bored with the same-old-same-old sometime. I found myself in a reading rut the other day and as I started to read yet another clockwork masterpiece, I just couldn't get through it. 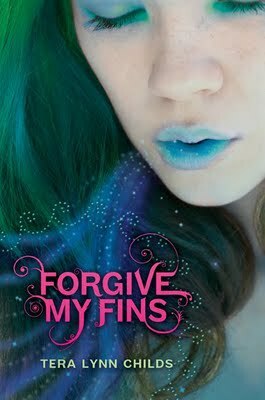 I just couldn't take the manners, the ettiqutte, anything...I needed something light, fresh, and fun...and that is just what I found in Forgive My Fins. It was just the breath of fresh air I needed to keep me reading and get me to push on through my TBR pile so...yay! This is the first book in the Fins series and revolves around Lily Sanderson dealing with life as a human on the Florida coast. She's trying to experience her human heritage after living her entire life as a mermaid princess in the kingdom of Thalassinia. Basically her main goal is to snag the popular swimming god and make him the kind to her queen so they can rule the ocean together in perfect watery bliss. The book itself was a pretty standard YA novel. Average, normal looking girl has secret crush on popular boy who won't give her the time of day, girl is harassed by unpopular boy who turns out to love her deeply and completely but she won't give him the time of day, Girl turns boy into merman and has to bring him to her underwater kingdom to meet her father. Okay...so maybe the last one isn't so common...but the first part of the book was kind of a cut and paste of a lot of other YA books. Even though it was pretty standard-fare for YA literature, the plot was cute, adorable, and had just enough twists to it to keep me entertained. There was the whole identity switch when Lily kisses Quince thinking it's Brody, and Lily's cousin trying to steal Quince away from her, and all sorts of other fun little nuggets of fabulousness. I really enjoyed the challenge that Lily's dad made her and Quince go through in order for her to get a "divorce". The challenges were both awe-inducing and occasionally tear-jerking in their sweetness and I really enjoyed them. Lily is a bit obnoxious if I do say so myself. She's so caught up in what she thinks is right that she doesn't even give anyone else a chance to share their thoughts about things. She walks all over both of her best friend's advice and pretty much burns Quince with her venom every time he talks to her. Even when Brody is obviously using her...and I really mean obviously, she doesn't see it and just obsesses about how much of a great swimmer he is. Also, her hatred of Quince seemed so dramatic. I would be flattered by all of the attention Quince showed Lily...if some boy drove behind me on the way to school every day for two weeks I would either be flattered or really creeped out...or if he called me every night to mess with me I would be head over heels because he was paying that much attention to me. Even in high school, everyone knows that one of the ways boys show affection is by picking on the girls they like...and it drove me absolutely crazy that Lily couldn't see how much Quince cared...particularly after they bonded. I definitely adored the cute little fish puns that Lily said all the time. They were all over the entire book...from Lily's own name (WATERlily SANDerson) to all the funny curse words that Lil used when she got angry. It reminded me a little of Spongebob Squarepants when he says...Tartar Sauce! Barnacles! or Fish Paste! lol...though Lily's were a little more creative like "Shoot it out your blow-hole Mr.!" or "Son of a swordfish! "...ahaha...they make me smile as I'm writing this even. I give Forgive My Fins 3.5 Keys. It was a bright, pink, girly, fluffy, and cute book. Sometimes that is what you need to get yourself out of a reading slump like I did. Everything can't be dark, depressing, confusing, or hard to figure out...sometimes you just want some salt-water-taffy, and that's what you get in this book. Though it was a tad over-simplified, the plot and story arcs were fun and easy to follow. There are a ton of cute scenes, a bunch of swoon-worthy love quotes, and a handsome biker-boy love interest...pretty much all a girl needs in a book sometimes. I will definitely keep this book in mind when I need something light. My mother-in-law calls books like this "coffee bean" books. You know how in a perfume store they make you smell coffee beans between each scent. Like that, theses books are a bit of a breather between intense and hardhitting books. Thanks for the review. I might have to check it out.